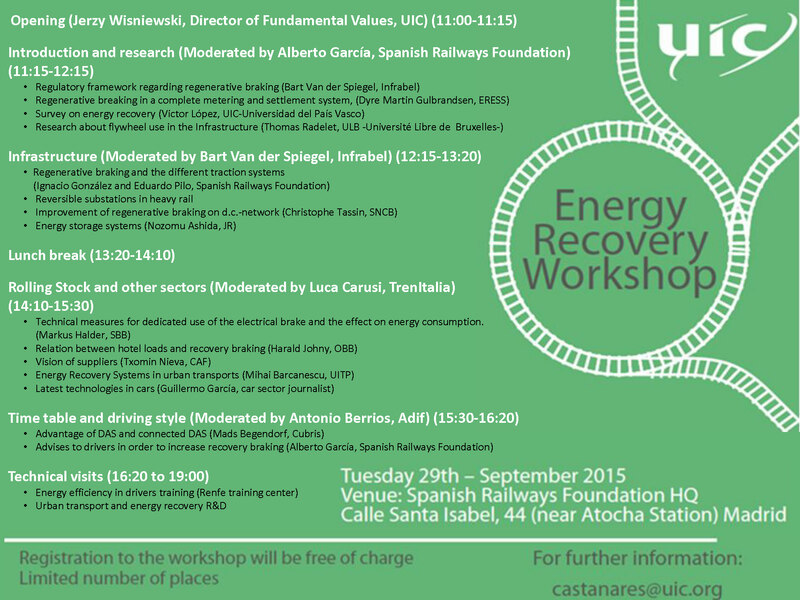 The UIC workshop dedicated to Energy Recovery will be held on 29 September at the Spanish Railways Foundation Headquarters in Madrid. This workshop will be an excellent opportunity for managers, advisors and professional specialists to exchange experiences on best practices of the main interfaces and progress on energy recovery in the railways, as well as the future and potential of energy recovery savings, and to learn alongside experienced operators and infrastructure managers. Experts in technology, research and data collection on energy recovery from around the railway world will have the special chance to meet and exchange on best practices on all aspects of this topic during the technical dedicated session, including a technical visit to dedicated facilities. Technical presentations on the performance and management of the energy recovery (legal and standard frame, infrastructure, rolling stock, driving, etc.) will be presented and will be followed by fruitful discussions that will allow for benchmarking as well as sharing best practices. We look forward to seeing you in Madrid on 29 September 2015.